Philly Cheese Steak. Egg Roll…Philly Cheesesteak Eggroll. There we go. And yes, this delicious ingenious concoction exists, not in Philadelphia, not in Chinatown, but on the North Side of Chicago. 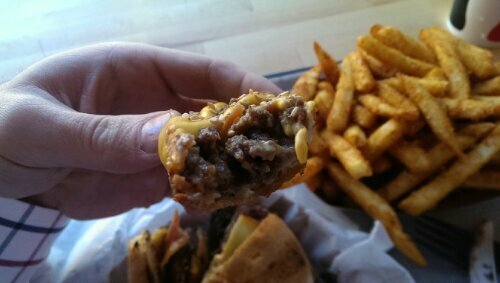 Bop n’ Grill is a counter service joint in Rodgers Park that tastefully combines two of my favorite cuisines – burgers and Asian street food. 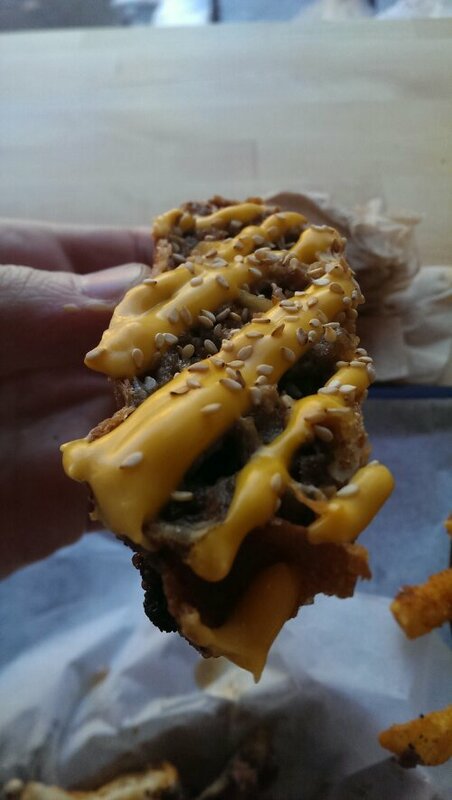 You should visit on a Friday or Saturday – these are the only two days their Philly Cheesesteak Eggroll is available. Limit two orders per customer and I can see why. 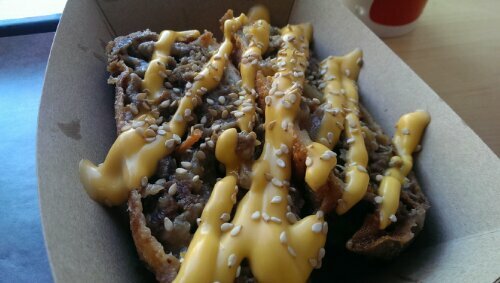 Start with a warm, crispy freshly fried wonton wrapper stuffed with thinly sliced ribeye and chopped griddled onions. Finish the tubular creation with a drizzle of a creamy Whiz style cheese – you have yourself a winner. I was torn between the Kimchi and Umami Burgers. Both I understand are fantastic, difficult to compare variations on my favorite beefy sandwich. 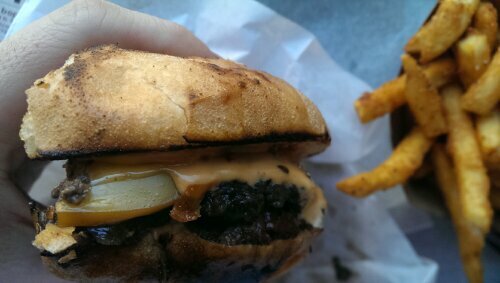 I opted for the Umami Burger on this trip as it had just been featured in a Diners Drive-ins and Dives segment. Smart choice. The beef was fresh and cooked properly – extremely juicy and well seasoned. 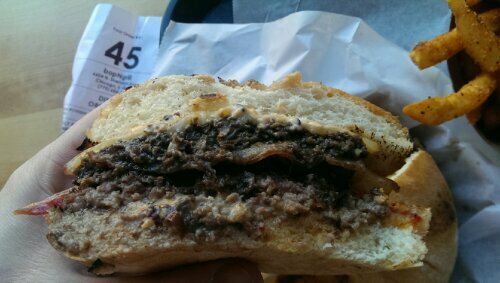 Atop the patty, we find a savory, earthy and completely unique Mushroom Duxelle, a thick slice of Gouda cheese and finally a light drizzle of truffle oil – in this case, I accept synthetic truffle flavor – sue me. 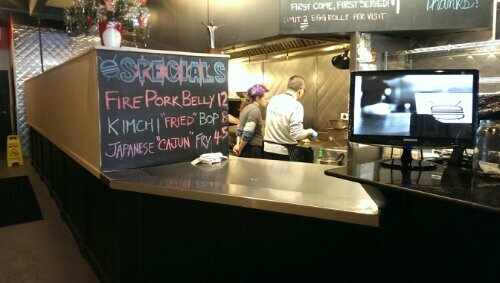 Though out of the way for some, Bop n’ Grill is a completely unique venture in Chicago that ties two of the world’s best genres of cuisine together – awesome Asian street food and the American cheeseburger. Do I really need to further convince thee to attend this gastronomic temple? Too far? Hop on Lake Shore Drive and you’ll be there in no time. Remember to tell ’em Hungry Hungry sent ya.